There are several different ways to ensure that the message about your online fundraising campaign with DonationTo is successful, and utilizing your LinkedIn account is definitely a prime option. However, it is important to make sure that you properly leverage your account for the maximum impact. Whether you already have a LinkedIn account or need to set up a new one, we will teach you the best practices to follow to increase your total number of donations – and by using DonationTo.com to create your fundraising page, you keep 100% of all donation and avoid credit card fees. It is important to make sure that your LinkedIn account has value. We recommend adding at least 100 connections so that you will have a solid base to work with. Consider for example how many people typically respond to something that you post on a social networking site. Even if you have 100 friends, you are most likely going to receive a response on each post from a maximum of 10 percent of them. Therefore, you need to have a large base of LinkedIn connections to provide you with a viable source of potential donations. Additionally, the larger your network is, the better the odds are that your fundraising information will be shared with people you do not know, and that is the best way to increase awareness of your cause. However, even if you do not currently have a large list of connections, there are still ways to leverage your network. 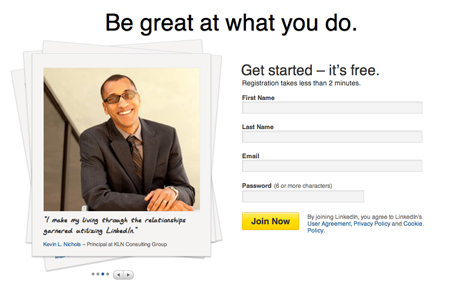 You can learn more about building your LinkedIn network here. If you want to raise money online, you will need to have a fundraising page that is backed by a host that has the ability to accept credit cards. Consider for example how rare it is for you to actually take the time to send a check to a fundraiser that you learn about online. Like most people, you are probably short on time and prefer to make an instant payment. With DonationTo, you can accept credit cards and payments via PayPal and WePay, and you will be able to keep 100 percent of the donations and avoid paying any credit card fees. To see a recent DonationTo fundraising page that has done well read here. Now that you have your LinkedIn account and a donation page up and running, you will be ready to tap into your network to spread the word about your fundraiser. This process is simple, even if you are still learning how to fundraise. It is important to use LinkedIn to leverage your business social media contacts as this will provide you with an important additional network of potential donors. By added LinkedIn into your overall social media strategy, you will have access to a strong base of contacts. Because you are tapping into your professional network with LinkedIn, it will be essential to create an email that is appropriate for this group of contacts. After all, you are not going to send the same message to your colleagues that you would to your closest friends. However, by utilizing our tips for creating a fundraising message for professionals, you will be able to greatly increase your ability to raise money online for your cause. Link Checking – It is imperative to make sure that your links work before you begin sending out messages about your fundraiser. Consider for example how frustrating it is when you click on a link and the page is not actually there. If this happens, you will turn off your potential donors, and it will be difficult to get them to continue to listen to your fundraising ideas. Therefore, you need to keep your enthusiasm for sending out messages in check until you are certain that all of your links are properly operational, and you also need to proofread your message to make sure that the link has been typed properly. Alternatively, you could make the process easier by copying and pasting the link into the body of the message. Conceptually, everyone’s emails should be unique, so make sure that you tailor them to each individual. By including personal details, it will be easier to draw a strong connection to your fundraiser, and this will make the reader more likely to donate online. By putting all of the sample pieces of the email together, you will have a cohesive message that hits all of the important points. You can use this sample template to help you construct each of your fundraising messages. It was really great to see you last week in New York City! I will actually be back in the city in June, and we should definitely have lunch again. 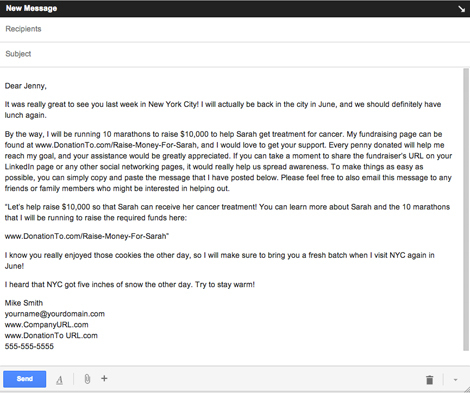 By the way, I will be running 10 marathons to raise $10,000 to help Sarah get treatment for cancer. My fundraising page can be found at www.DonationTo.com/Raise-Money-For-Sarah, and I would love to get your support. Every penny donated will help me reach my goal, and your assistance would be greatly appreciated. If you can take a moment to share the fundraiser’s URL on your LinkedIn page or any other social networking pages, it would really help us spread awareness. To make things as easy as possible, you can simply copy and paste the message that I have posted below. Please feel free to also email this message to any friends or family members who might be interested in helping out. I know you really enjoyed those cookies the other day, so I will make sure to bring you a fresh batch when I visit NYC again in June! I heard that NYC got five inches of snow the other day. Try to stay warm! Now that you have a perfectly tailored sample message, you are ready to start personalizing it for each of your LinkedIn connections. Again, it is important to write a personal introduction and conclusion for each message. After all, you do not want to send each person a message that contains information that is not relevant to them. Consider for example how disastrous and embarrassing it can be when someone sends a message to everyone in their company that was intended for just one person. If you simply copy and paste the entire message to each person without altering it, you will confuse almost everyone who receives it, and this will make it much more difficult to get people to connect with your fundraising ideas. In order to send a message with LinkedIn, you need to log in and then navigate to your “Contact Section.” Once you are there, it will be simple to select each of your contacts individually so that you can send them a personalized message. As you are sending messages, you will notice that LinkedIn has a feature that shows you how many connections each of your contacts has. You can leverage this by making sure that you focus your attention on contacts that have at least 200 connections. Although you do not want to skip over anyone, you might want to reach out to the people who have the most connections first. After all, if you can get them to share the URL of your online fundraising page with their list of connections, you will have a much better chance of meeting or exceeding your fundraising goal. The best way to have a successful fundraiser is to get your information to go viral, so make sure that you remind each of your connections to spread the word. For example, if you have 200 contacts who each have 200 contacts, you will gain access to an audience of 40,000 people. Even if you only capture the attention of one percent of this total audience, you will still have the opportunity to encourage 400 people to donate online. As you can see, LinkedIn definitely has the potential to help you hit your goal quickly, so it is important to make sure that you leverage your contact list appropriately. The second status update contains 139 characters, and this makes it perfect for both formats. In order to share your status on LinkedIn and Twitter, you will need to make a selection from the drop-down box on LinkedIn before you post your update. LinkedIn gives you multiple ways to share your status updates with your connections. In addition to enabling you to connect your account to Twitter, you can choose from two more posting options. The most common option is to share your updates with all of your connections. However, you can also choose to share your update publicly with every member of LinkedIn. All of these functions can be accessed from the drop-down box that is attached to each status update box. Although it might seem like you should always share everything with all of your connections and Twitter, it is important to consider the potential positive impact of specifically targeting certain connections. After all, if you are able to entice people who do not even know you by making a public post, it will be easier to extend your viral reach, and you could also hit your fundraising goal more quickly. Because of this, it is definitely a good idea to alternate which sharing method you select. When it comes to learning how to fundraise more effectively, it is important to be willing to try different things, and you must also take the time to gauge the effectiveness of each option. After all, if you simply utilize all three posting methods without tracking the responses that you receive, it will be impossible to determine if your connections appear to prefer a specific type of communication. Ultimately, we recommend that you try all three status update styles to learn which one has the biggest positive impact on your fundraiser. However, even if you get the majority of responses from one of the posting types, it is still a good idea to continue to use all of them to ensure that your updates are seen by the largest possible audience. Keep in mind that anytime you choose not to share your status updates on Twitter that you will be able to post a message that is significantly longer. For this reason alone, it is important to alternate your posts. You will soon learn that each of your connections responds to things differently, and their personality type will determine whether they prefer shorter or longer messages. For example, one of your connections might feel the need to receive as much information as possible before they will take action, but another contact might be turned off by long messages. Again, this is why it is so important to vary the length and style of your status updates. Many people who are new to fundraising will make a major mistake that can prevent them from hitting their goal. To avoid this pitfall, you must make sure that you do not allow yourself to post one status update or send out one round of messages and then fail to do any follow-up. Sadly, there are many people who either believe that one update will be enough or who lose steam shortly after they launch their fundraiser. If you allow yourself to fall into this trap, you will be doing your cause a great disservice. The best way to utilize LinkedIn to ensure that everyone finds out about your cause is to post contextual updates that are timed to coincide with how long your fundraiser has been running. For example, in the beginning, you will need to introduce your fundraiser, but later on, you will provide updates instead. Before we give you a sample schedule that will make it easy to post updates, it is important to understand why you should use this template. Consider for example how you have felt in the past when you supported a fundraiser but never found out the end result. Although some people will simply forget about these incidents, most people expect to get updates so that they can learn what has happened with the money that they donated. After all, if someone gives you a $100 donation, they definitely deserve to know whether or not you hit your goal. However, it is also important to remember that every donor deserves the same level of respect and communication, regardless of whether they donate $1 or $100. By following this guideline, you will encourage people to make additional donations, and it will also be easier to get them to support your future fundraising ideas. The best way to keep people in the loop about the progress of your fundraiser is to make a post once a week. Anything more frequent than that could be look at as annoying, especially because your connections will be using LinkedIn as part of their professional lives. However, you need to make sure that you do not let a longer time period than one week pass between updates. The Introduction – This will be your first status update about your fundraiser, so it is important to let people know what your cause is all about. You should provide basic information about the fundraiser, and it is also a good idea to let them know why the cause is important to you. Additionally, you should mention the fact that you are using DonationTo as your online fundraising platform, and make sure to let everyone know that we let you keep 100 percent of the donations that you collect. When your connections find out how DonationTo works, it will make them feel even better about donating, and it will also provide your fundraiser with an added level of legitimacy. The introduction must contain the URL to your DonationTo page, but you also need to ensure that you include this URL in all of your posts. In other words, even though you will not provide the same exact information again, each of your posts must assume that someone is learning about the fundraiser for the first time. It is also important to keep putting the URL in front of people because they will be much more likely to make a donation if the link is easily accessible. First Week Update – This post should remind people about the fundraiser, and it also needs to provide an update about the progress that has already been made. Even if you are behind on your goal, you need to be upfront about this issue to help encourage people to make donations. After all, if you fail to create a sense of urgency, it will be difficult to convince people to donate. Consider for example how you would respond if a cause that you truly believe in was having a hard time getting support. Most people will be willing to chip in to help out a cause they can believe in, especially if you let them know how urgent the situation is. However, if you are doing better than your original projection for the first week, you can also use this to advantage to encourage people to get your over the finish line quickly. Either way, your first week update is an essential component of your fundraising campaign. Second Week Update – During your second update, you should take the time to remind everyone what you are raising funds for. This is important because you want all of your potential donors to feel connected to the person, animal or event that you are trying to help. For example, if you are raising money for a person who is ill, you need to let people know how that person is doing. Consider how you would feel if you were involved in a fundraiser to help someone with cancer and you found out that the donations that had already come in were able to help that person get necessary treatment that made them feel better. This would give people who had already donated a feeling of accomplishment, and it would encourage people who had not participated yet to join the fundraiser. Essentially, you need to make sure that everyone who reads the updates is able to quickly understand the need for their donation. It is also important to provide another update on the progress of the fundraiser. Once again, you can use this update to create a sense of urgency that ties directly into the level that you have hit. Make sure that you use percentages to help people understand exactly where you are. In other words, if you are trying to raise $1,000 and you have received $200, you can tell people that you have already reached 20 percent of the goal. Third Week Update – You should use the third update to provide a visual representation of your fundraiser. After all, most people prefer to receive information via images, and this is especially true on the Internet. For example, if you were given the opportunity to look at a picture or read a lot of text, the odds are high that you would pick the picture. It is also important to engage people in multiple different ways, and a picture can make them feel more personally connected to the project. If you are raising money for a patient who is ill, you should consider posting a photo that shows how they are doing. However, it is important to make sure that the individual is comfortable with the image before you share it with all of your LinkedIn connections. Alternatively, if you are doing something specific to raise funds such as running in marathons, you could post a picture of yourself crossing the finish line of your last race. Regardless of exactly which picture you choose to use, the ultimate goal is to make sure that it will help raise awareness of your fundraiser. Therefore, you should consider putting the URL of your DonationTo page on the image. Fourth Week Update – Asking others to donate their status update for a week or even just a day is a great way to spread the word about your fundraiser. However, you need to make it a coordinated effort by picking a specific date and time that each person will post an update that contains a message that you have written. Consider for example how much more likely you are to look at a news story that is posted on a social media site if several of your friends shares it on the same day. You will experience this same level of increased interaction when you have a large group of people who support the cause by posting identical status updates. This simple format will be easy for people to copy and paste, and it will help ensure that you hit your fundraising goal. Fifth Week Update – For the fifth update, you should encourage people to click the Facebook “like” button on your DonationTo page. Consider how often you have found out about something new on Facebook because one of your friends clicked “like” and it was posted on your news feed. This is a very powerful tool that does not require a lot of interaction from your supporters, and it can greatly increase your fundraiser’s exposure level. When you post this update, make sure that you explain that by simply clicking “like” on your DonationTo page, the reader will be supporting your important cause. The best part about taking advantage of this feature is that it will enable your LinkedIn connections to share information about your fundraiser with their personal social network. Again, going viral is the absolute best way to turn a fundraiser into a success, so you want to encourage people to share the link to your DonationTo page as often as possible. Another perk is that most of the people who use LinkedIn will have a different list of friends on Facebook, so you will be reaching out to a completely new audience. Sixth Week Update – During this week, it is a good idea to show another visual representation of your fundraiser. However, instead of using a picture, you should try to post a video this time. If you consider how much more powerful it has been in the past when you have watched a fundraiser video instead of reading a description, you will easily see why you need to create a video. Your video should create more depth for your fundraising story. Therefore, it is a good idea to either capture a video that is related to the topic of your fundraiser or to at least make a slideshow of images. You may also be able to show the expected impact of the fundraiser during the video. For example, if you are raising money to provide necessary updates to an animal shelter, you can show everyone what it looks like now and how it will be transformed by the fundraiser. For the transformation stage, you would need to either use illustrations of the projected changes or have someone who is affiliated with the project do a walk-through of the shelter while explaining exactly what changes will take place if the project is fully funded. Seventh Week Update – During this week, it is important to provide another update about the progress of the fundraiser. Again, you should use percentages to let people know how close you are to hitting your goal. Additionally, this is the perfect time to publicly acknowledge people who have made large donations. After all, social media is all about personal connections, and people can be easily influenced to take action if their friends or colleagues have already donated. For example, it is very common for people on Facebook to decide to “like” a page after they find out that one of their friends likes it. You can use this same mentality to your advantage to increase awareness and donations. Because you will be using a status update that has a limit of 600 characters, you will not be able to mention everyone. However, you need to make sure that you do thank everyone who has already participated. Most people will understand that you are giving a special nod to those who have gone above and beyond with their donation, but you still want everyone to feel like they are appreciated. After all, a person who only donates $5 might not have much more than that to get them through the next week. Either way, by capitalizing on the social aspect of LinkedIn, you can make people who have not donated yet feel more excited about participating along with their co-workers and friends. Eighth Week Update – You should use this update to make sure that everyone is aware of your fundraiser. After all, some people do not log in to their LinkedIn account on a regular basis, and other people will be busy with vacations and business trips. Therefore, it is a good idea to use this week to do a light reintroduction to your fundraiser. If you consider how many times you have missed a status update on LinkedIn or Facebook, it will become easy to understand why it is a good idea to post a new introduction. However, by making it more of a light introduction, you can still continue to encourage donations from people who are already aware of your project. During this update, you should reiterate the purpose of the fundraiser, provide the link to your DonationTo page and include a short blurb about the current progress. For example, after you have introduced the fundraiser, you could say: “We are already [fill in the applicable amount] percent of the way to hitting our goal. Please consider making a donation today to help this worthy cause.” This approach will provide a sense of urgency for new and current supporters, and the update will keep everyone involved in the process. Ninth Week Update – This week you can use a slightly different approach to get the word out. Instead of providing an update or asking people to post a status update that you have written for them, you should ask your supporters to share the link to your DonationTo page along with their own personal statement about the fundraiser. Although some people might choose to simply post the link without any additional information, there will definitely be people who will share their personal thoughts about your project. This is important because it will make their friends and co-workers feel more inclined to join your cause. Consider for example how often you have supported a fundraiser that one of your friends was excited about. Even if it was a cause that did not speak to you personally, you probably felt more inclined to help out because it meant something to someone who you respect. If possible, you should monitor the posts that your supporters put up so that it is easy to contact people who ask specific questions about the fundraiser. However, even if this is not possible, visiting the DonationTo page should help people discover their own answers. As an added bonus, all of the people who are exposed to your fundraiser through this process may also decide to share the link to their list of connections, and this will greatly expand your overall network. 10th Week Update – During the tenth week, it is a good idea to ask people to provide their support for your cause by sending a message to their list of contacts. You should also make sure that you mention that this is a great way for people who are unable to provide much financial assistance to help you hit your goal. Consider for example how often you have wanted to donate a larger amount to a fundraiser but were unable to afford it. If the host of that fundraiser had asked you to send out an email to help them collect more funds, you would most likely have been very willing to provide this level of assistance. Therefore, you should give all of your supporters the ability to do the same thing. When people email their friends and co-workers about your cause, they will help spread awareness. Additionally, they will give your fundraiser legitimacy. After all, most people want to make sure that their money will be used appropriately, and this can sometimes cause them to hesitate before they make a donation. However, if someone who they know personally tells them about the cause, they will feel more comfortable with the project. Therefore, it is a good idea to ask each of your supporters to consider donating their time to the project by sending out an email to everyone on their contact list who they believe might be interested in the project. 11th Week Update – Your list of LinkedIn connections is filled with business professionals, and many of them will have blogs and websites that they update on a regular basis. Therefore, you should ask your supporters to assist you with getting the word out by utilizing their own resources. For example, anyone who has a blog can easily write a post that describes your fundraising efforts and encourages people to visit your DonationTo page. You could also ask your supporters to temporarily add the URL to their links page. There are two important reasons to ask your LinkedIn connections to share the story of your fundraiser outside of the social media realm. The first reason is obvious: it helps to spread awareness of your project. However, the second reason might be less clear to those who are not overly familiar with search engine optimization. To put it as simply as possible, each publicly accessible website that provides a link to your website will be indexed by Google and other search engines, and this can have a dramatic impact on your search engine rank. In other words, if your fundraiser is currently on the fifth page of Google’s search results for the applicable search term, you could climb onto the first page with the assistance of bloggers and other websites. This is important because it will help people find your fundraiser, and you might even gain support from people who simply stumble across it on Google. 12th Week Update – Once you hit this stage of the fundraising process, you will be able to start reusing some of the ideas from your previous weeks. However, it is a good idea to introduce slightly new content each time. For example, if you posted an image of the person who you are raising money for during the third update, it is a good idea to post a new image during the next few weeks. By doing this, you will let everyone see what changes have happened, and you can also keep them interested in the project by engaging them visually. You can follow the same template for the order that everything is done in if that is easier for you, but you do not have to feel confined by these guidelines. For example, if you would rather post a new video before you post a new photo, it is okay to flip the position of those two updates. As long as you continue to post status updates and new information that is relevant to the cause throughout the entire process, you should see a higher level of donations come in after each post. Again, this is why it is essential to make a post once a week. After all, if you miss a week, you will not benefit from the temporary donation surge that typically happens after each post. One of the best ways to spread the word about your fundraiser is to ensure that everyone who visits your LinkedIn page can easily find the URL to your DonationTo page. After all, not everyone will see each of your posts, and they might not want to take the time to scroll through previous updates to find the link. Therefore, you need to make sure that the URL can be found at a glance. Just like any other social media site, LinkedIn gives you the option to list any URLs that are applicable to your work and personal life. You can enter the URL by clicking on the editing your contact information. You can also list your duties as a fundraising organizer in your experience area, and this will provide you with another valuable opportunity to get the URL in front of people. By taking full advantage of your profile, you can increase awareness and make it easier for people to make donations. As previously mentioned, you can edit your contact information on LinkedIn to include the fundraiser’s URL. This is something that you can also easily do on all of your social media pages. If you fail to take this step, you will be missing out on an easy way to get your URL in front of your connections. Additionally, if you have a public social media page, search engines will be able to pick up the URL when they index the site. If you consider how often you have visited a friend’s page in order to connect to their blog or website, you will quickly understand why you should always place your URL on your LinkedIn profile. After all, most people take at least a passive interest in the projects that their friends and co-workers are working on, and you need to take advantage of this by making it extremely easy for everyone to access the fundraising page. Again, if you fail to take this step, you will miss out on some donations. You will have the option to add information about organizations that you have volunteered for under the experience section that we mentioned earlier. This space is the perfect place to list your fundraiser, and it will also let you fill in critical details that can capture the attention of people who visit your profile. You should fill in your role with the fundraiser, along with all of the other applicable pieces of information. After all, the entire purpose of LinkedIn is to help people learn about networking opportunities and new companies, and most people will investigate your fundraiser because it will be new to them. For example, when you update your profile to include the information about your fundraiser, you will also be notifying everyone on your contact list about your project via the updates section of LinkedIn. Although this is definitely a more passive approach to sharing information, it can still get additional eyes on your fundraiser. Ultimately, your goal with any social media site should be to capture as much attention as possible. If you can get people to leave LinkedIn to look at your DonationTo page, the odds are really good that they will decide to make a donation. When you decide to start an online fundraiser, it is important to select the right platform. DonationTo makes it easy for anyone to start the process, regardless of your level of experience, and you will not need any special technical skills. Additionally, the DonationTo name will add legitimacy to your project, and we do not charge any credit card fees. When you let people know that you will receive 100 percent of the money that they donate via PayPal or WePay, they will feel more confident about the entire process. LinkedIn is in important resource for gathering supporters. If you do not have a LinkedIn account, you should sign up for one as soon as possible. A solid LinkedIn account should have at least 100 connections, but you can get started even if you have not hit that metric. Just like any other social media site, LinkedIn will let you post pictures, videos and status updates. However, because it is a professional site, you should make sure that you only post an update about your fundraiser once a week to avoid becoming annoying. With our 12 week approach to capturing attention, it will be easy to gain new supporters and keep everyone in the loop. LinkedIn also gives you the option to share all of your status update on Twitter. This will save you a lot of time, but it will require that you make each of your updates be 140 characters or less. To avoid being inhibited by this restriction each time, you should alternate between cross-posting and utilizing the full 600 characters that LinkedIn allows. As long as you fully utilize all of your resources and update LinkedIn weekly, it should be easy to make your fundraiser go viral. The assistance that you receive from your supporters can easily make the difference between a successful and unsuccessful campaign, so make sure that you provide easy to follow updates, and ask for their help throughout the process. Our donation website offers the unique possibility to crowd fund with LinkedIn. The crowdfunding has never been this socially interactive.